- Hammersquid: A weirdo creature from the deep that sort of looks like an amalgamation of a hammerhead shark and a squid. He features some cool details in his tentacles and was released in a really nice, very slightly translucent blue color. - Beastly Beachdweller: This dude, who came in hot pink, is a humanoid, three-eyed surfer with big monster feet. It's actually my least favorite of the five because it's the least monstrous and most gimmicky, but still pretty cool. - The Glooper: I love this one. 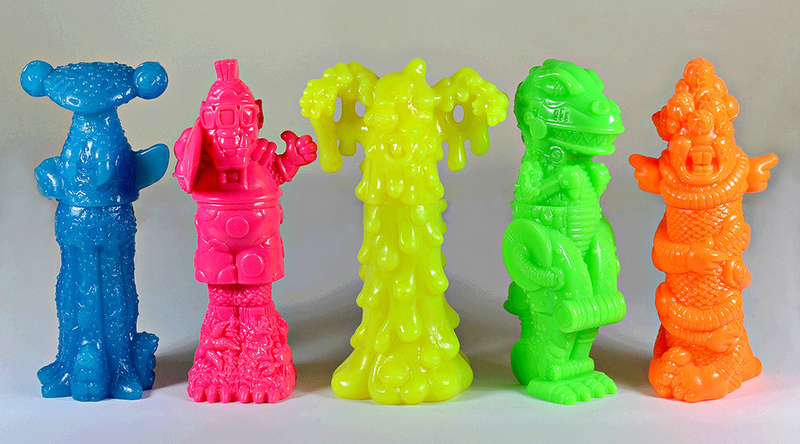 It's a big ol' day-glo yellow melting pile of goo. It could be a candle wax monster, or maybe some sort of ghost, but whatever it is, it's all kinds of awesome. - Rexonator: A robot and a dinosaur combined. In neon green. You can't lose with that. - The Strangler: This is the weirdest of them all. It's an orange mess of scales, numerous coiling arms and eyeballs. I also get a bit of a totem pole vibe from it. I don't know quite what to make of it, which I love. BONUS: The bird monster pictured to the right was offered as part of the same set, even though he's not a marker. He's a rubber water squirter that was available as the alternate toy safe for kids under three. Great stuff, huh? Definitely some of my favorite fast food toys of all time. Where: Released in kids meals in the U.S. at fast food chain Wendy's. For more Weird Writers photos, check out my Flickr stream. Those are superb - and it makes you think there might be a whole range of "Under 3" toys to go with them too! The orange and yellow ones are my favourite. Thanks for putting these up, I just found the top part of the yellow melting wax one and thought how cool it was!